CLICK HERE to enter. Use one of the codes below. Play the instant win for the prizes. You can also go back and play the streak game but the streak game is for the grand prizes only. Instant-Win Prizes – Awarded via the Instant-Win Game: Instant-Win Prizes are randomly awarded throughout the Promotion Period and are listed as follows: Instant-Win Prize Quantity / Instant-Win Prize Description / ARV of each Instant-Win Prize. Fifty-three (53) / BeatsX Earphones. / ARV: $119.95. Twenty-five (25) / Beats Speaker. / ARV: $179.95. Fifty (50) / Spalding NBA Official Basketball. / ARV: $169.99. Three hundred two (302) / $20.00 NBAStore.com e-Gift Card (subject to terms and conditions as set by issuer). / ARV: $20.00. 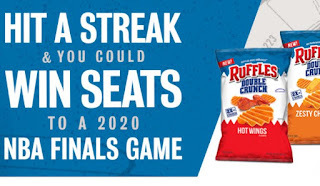 Grand Prize (1) – Awarded for the Streak for the Seats Challenge: Trip for winner and winner's one (1) guest to attend a 2020 NBA Finals games (the "Game"). Travel is expected to occur for a three (3) day/two (2) night trip during the following time period: May 31, 2020 – June 17, 2020. Trip consists of round-trip coach air transportation (from major airport nearest winner's home) for winner and his/her guest; double-occupancy hotel accommodations for two (2) nights; two (2) Game tickets, and one (1) $500.00 American Express gift card (subject to terms and conditions as stated by issuer). Approximate Retail Value ("ARV") of Grand Prize: $3,500.00.